You usually add manures, compost, organic matter, and/or manufactured organic fertilizers before planting your urban garden to build the fertility of the soil in anticipation of the new garden season. 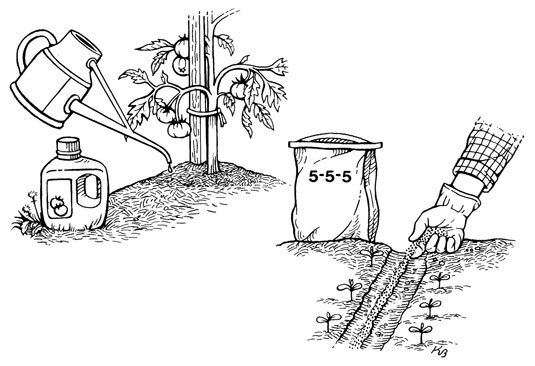 But you can use fertilizers in another way, too, with a technique called side dressing. Side dressing means adding organic fertilizers while the plants are actively growing to ensure a steady supply of nutrients. The most common use for side dressing is with fast-growing annual flowers and vegetables because these plants use up and need more quickly available nutrients than trees, shrubs, and perennial flowers. You’ll know your plants may need a side dressing of fertilizer if they are growing slowly or the leaves are small or yellowing. To put side dressing to work for you, simply add a few tablespoons of a granular fertilizer per plant or a few pounds per 25-foot row of vegetables monthly during the growing season. Or use liquid fertilizers by adding them to your watering can and applying them every few weeks. Follow the directions on the fertilizer container for the frequency. Urban gardeners often take advantage of growing plants in containers, hanging baskets, and window boxes. These containers have a relatively small amount of soil that doesn’t contain many nutrients naturally, not to mention watering and rain tend to leach the nutrients out of the soil. The result is often struggling, starving plants. But you can do something to help improve your container gardening success. Apply regular doses of fertilizer to the flowers, fruits, and vegetables you grow in containers throughout the growing season to help them survive. Generally, fertilizing with a liquid product every few weeks helps keep these plants growing strong. Follow the recommendations on the fertilizer’s packaging for proper dosage amounts. Don’t be overzealous when side dressing plants. Adding too much fertilizer, especially to containers, can cause fertilizer salts to build up in the soil, which can harm the roots of your plants. Also, adding fertilizer during dry spells or cold weather is a waste of time and money because the plants don’t readily take up the nutrients under these conditions.